A few years ago, Pastor Bryan Wolfmueller (Hope Lutheran Church—LCMS, Aurora, Colo.) proposed several criteria for evaluating 'praise songs.' As co-host of a humble radio show, “Table Talk Radio,” Rev. Wolfmueller uses the “Praise Song Cruncher” segments to draw attention to the error of Mysticism which imbues that genre. While steering us clear from our feelings about insipid 'praise songs,' he identifies here in this podcast the Scriptures against which so many chart-topping CCLI praise songs are crunched. The Mystical content of the genre is the millstone which typically pulls these songs underwater, and points two and three of the Cruncher address this concern. Interestingly, Wolfmueller identifies that many of these songs don’t even use complete sentences. At first it may seem a minor point against musical art for art’s sake. However, Paul gave the Corinthians a going-over in Chapter 14 (the first time around) about the harm that comes when people (particularly unbelievers) don’t know what you’re talking about in church. The Church’s acceptance of Post-Modern laxity in language is working against us here as well, but that topic will be handled in a different post by a more gifted pen. I’m told our seminary teaches pastors to preach in manner in which they will be understood but also in such a way that they won’t be misunderstood. This is also sound advice for deciding when to drift from the half-millennia of Lutheran hymns prepared for us. The final challenge of the Cruncher is to make the user thoroughly aware of the Mystical content. Reflecting the fallen self-absorbed culture, understandably a common error is that these songs are not about God and what He has done but instead about me and my feelings. (As if my feelings have anything to do with Christ’s Gospel, but carrying over sectarian worship songs introduces their false doctrines as well.) Does the song use language better suited for a Top-40 love ballad? Can you substitute your sweetheart’s name in the song and still sing it? Does the song encourage abandoning oneself, being lost or absorbed into God? Does the song seek to find God inside of you? Does God come to me/speak to me internally or externally? Is this a Lectio Divina warm-up act? It’s no mistake that so many 'praise songs' make the focus of the songs not about Jesus, but about us. Because of the thorough flogging dozens of CCLI-topping ‘praise songs’ receive in the Cruncher, and the harm they introduce into our congregations, once again we’re left with only one justification for continuing these sectarian practices: “But We Want To.” Stop me if you've read this sentiment in the Old Testament over and over and know where this cycle leads. Last week I posted some resources for daily devotional materials. For anyone who is interested, here is a link to the page that will have the weekly updates. Lenten blessings to all our readers! 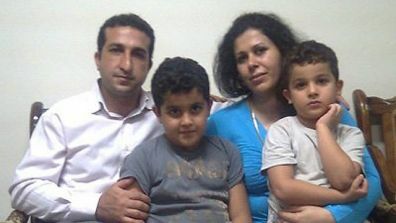 The Sabre of Boldness is about "them"
Last week it was reported that Youcef Nadarkhani, a Christian pastor in Iran pictured here with his family, has been convicted on charges of apostasy from Islam and has been sentenced to death. The Gottesdienst Sabre of Boldness award is intended to honor people just like these. If I didn't say it clearly enough in my post-acceptance post on Intrepid Lutherans, let me state it now for the record: the award I was given by Gottesdienst back in January is not about me. It’s not about how “righteous” or how “brave” I am (that’s the somewhat humorous part of the award, actually), and it certainly isn't about how “bad” anyone in the WELS is. Fourth, and this one is really important: the Sabre of Boldness is not given to the kind of person we have determined to be most worthy of all, because we know we could never make such an assessment. The Sabre lapel pin is actually two crossed sabers: one for the recipient, and the other—which is really the more important—is for all the unrecognized heroes of the faith we wish to honor. The recipient wears the pin on their behalf. We could not possibly know who they all are, but we know they are legion. Most important among them are those who have become martyrs for the faith, who were deemed worthy by Almighty God to suffer to the point of blood. Here we could speak of Deacon Joseph Mabior, who last August became the victim of the violent Islamist campaign against Christians in South Sudan, when attackers rushed at him and shot him twice in the legs. Or we could speak of thirty men and women from the town who covered him with their own bodies in a failed attempt to protect him. All thirty died. Or the 185, mostly women and children, who also died in militia attacks there last August, apparently for no other reason than that they were Christians (World, November 7, 2009, 52-53). Or of seven family members in Pakistan who died in August, six of them burned to death by a taunting Muslim mob that had broken into their house and shot the grandfather dead, just because they were Christians, part of the tiny Christian minority there. Or of the Christians in Iran who are routinely persecuted and ordered by government officials to renounce their faith and return to Islam. Or the community of 350 Christians in Algeria, where Muslim extremists tried to prevent them with death threats from celebrating Christmas in their rented building only last month. We could go on to stories from Laos, Nigeria, Indonesia, China, and elsewhere. And these are only the ones that make the news. If we are to believe the data from World Christian Database, there are in the world over 450 Christian martyrs daily on average. Listen, the Sabre of Boldness is most especially meant to be about them, not us. And to remind us of the true nature of Christian confession—martyria in the Greek—lest we forget, amid the luxuries of American Christian freedom. So here, in our own little way, we just pick somebody out from among us, to bear the Sabre this year, mostly for them. But this award is not about us (i.e., the editors) or about them, really (i.e., the Sabre recipients). It’s about all the unsung heroes of the faith which are routinely missed, in the handing out of awards. There’s a little lapel pin we give to the recipient, because we don’t have the cash to hand out real sabers, and the pin has two crossed sabers: one for the recipient, and the other for all those heroes who go unmentioned, because we don’t know them. They confess the faith, they persist, they don’t back down, and for it they suffer. In some cases the suffering is quite physical, such as North Korea, China, Indonesia, Iran, Iraq, Egypt, and Sudan – places you should all add to your congregation’s Sunday prayer list – where people are brutalized and killed by angry mobs who cannot abide their Christian confession. In other cases, it’s more subtle, though no less real: the loss of livelihood or the threat of it, the loss of friends or status, or the loss of reputation, something the catechism tells us is one of the worst things you can lose. They get the sniffed-at treatment, the turned up noses, the complaints that they are evil, malignant, or insufferable, all because they would not compromise the faith they knew to be right, in the face of sometimes tremendous pressures from without and within. They’re people like Moses, with enemies like the sons of Korah, who rise against them and say, “You take too much upon you, seeing all the congregation are holy, every one of them, and the LORD is among them: why then do you lift up yourselves above the congregation of the LORD?” And like Moses, they humbly suffer such abuse, and perhaps wish they could be somewhere else, or do something else, but they know that they cannot be unfaithful to their Lord. And they’re all over the place, indeed all over the world, and they silently suffer for their faith. And we salute them all tonight. That’s what the Sabre is about, really. But we do like to choose one bearer, to carry it, as it were, each year, on behalf of them all. So let us pray for people like "them," all of them who walk the martyr's path for the confession of Christ. And let us all (I include myself) be careful that we don’t allow ourselves to be used by the devil to become persecutors of others. Below is a portion of a pastor's newsletter I just delivered to my congregation. In it, I offer some resources for prayer and meditation at home. The suggested devotional format includes the Daily Lectionary from Lutheran Service Book, and since the Bible readings start over on Ash Wednesday, I thought this was the perfect time to introduce it. The suggested Psalms, however, are my own suggestions, based on the Daily Lectionary and the Psalms assigned for the Sundays in the historic lectionary. The portion of the Small Catechism we're beginning with follows our Sunday School plan, so it kind of starts in the middle. The Treasury of Daily Prayer essentially includes all the same material. Why not just suggest they all purchase a copy of the Treasury of Daily Prayer? Two main reasons. One, this simple format breaks down the Small Catechism into weekly portions and puts the whole devotion onto one 5-1/2" x 8-1/2" card. Two, after using the Treasury for over a year, I think it's a great resource, but I feel disconnected from the Bible as a book when I use it. (Maybe it's just a personal preference.) So I'm distributing three bookmarks with these resources (Old Testament, Psalms, New Testament) with the Bible references printed out on them for three months at a time so that members can continue to use their own Bibles. 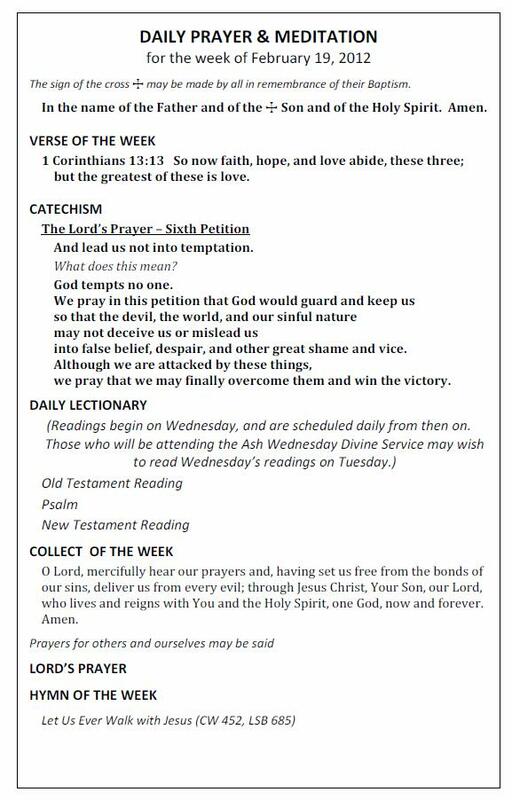 I'll include below some links to PDF files of the daily prayer resources for this week and the bookmarks for the next three months. If anyone finds these resources helpful, let me know and I can link the weekly updates that I'll be including in my local service folder. And taking the twelve, [Jesus] said to them, “See, we are going up to Jerusalem, and everything that is written about the Son of Man by the prophets will be accomplished. For he will be delivered over to the Gentiles and will be mocked and shamefully treated and spit upon. And after flogging him, they will kill him, and on the third day he will rise” (Luke 18:31-33). Even with plain words like these before them, Jesus’ disciples didn’t understand what Jesus was telling them. But by the gracious working of the Holy Spirit through the Word of God, we do. And because we do, we set aside every year a season called “Lent” in order to slow down from our busy-ness and reflect on the battle our Lord waged for us against sin, death and the devil, a battle that culminated in his crucifixion, his burial, and his resurrection from the dead. His victory is our victory, and the victory of all who trust in him. Lent begins this Wednesday, February 22nd. It’s a season for reflection, repentance and renewal. It’s a season for reevaluating our walk as Christians and for recommitting ourselves to the message of the cross and to the way of the cross, to the daily self-denial to which our Savior calls everyone who would follow after him. It’s also a season in which the Church intensifies its emphasis on catechesis – the instruction in the Word that has as its primary goal the creation and sustaining of faith in Christ, and how that faith expresses itself in the Christian life – the baptismal life. Catechesis is not a one-time, learn-this-and-be-done-with-it kind of instruction. It’s lifelong, from baptism to the grave. So catechesis is for children, but it’s not only for children. It’s for all who would be Christians. In addition to the regular weekly opportunities for catechesis already offered (Sunday morning Bible class and Divine Service), I would like to invite all of our members to participate in two other opportunities for intensified catechesis, one for the church, one for the home. As usual, we will be offering Wednesday evening prayer services during the Lenten season, beginning with the Divine Service on Ash Wednesday, continuing with Vespers (“Evening”) services on the five Wednesdays between Ash Wednesday and Palm Sunday. In these special services, we will be reviewing the Psalms sometimes referred to as the “penitential” Psalms, as well as a portion of Luther’s Small Catechism and Luther’s six catechism hymns. The other opportunity I want to set before you begins now during Lent, but does not end there. In fact, the idea is that this would be the beginning of a routine that would never end. It’s an opportunity to make prayer and Bible reading a daily part of your family’s schedule. I have not urged this among you as I ought, and I confess that even I, as a pastor, have, until now, failed to implement this properly in my own home, and for that, I am sorry. But since Lent is for reflection, repentance and renewal, I invite you to join me today in reflecting, repenting, and, with the comfort of God’s forgiveness, making a change for the better. Maybe you and your family have already been using the Meditations booklets put out by Northwestern Publishing House. Maybe you have been using a devotional format from the hymnal. This is good, and I do not want to discourage it in the least. I would simply like to suggest something more comprehensive. A very short and simple format for morning, mealtime and bedtime prayer, adapted from Martin Luther’s own suggestions in the Small Catechism. A pattern for Daily Prayer and Meditation to be used every day in family devotions. Most of the elements of Daily Prayer and Meditation are set up to be repeated each day for a week, changing every Sunday, so every Sunday the order for Daily Prayer and Meditation will be printed on the back of the service folder (or offered as a separate insert). It will also be available for download on our website. The Scripture readings that make up the Daily Lectionary change daily, so they are printed on three bookmarks (for Old Testament, Psalm, and New Testament) which you can keep in your Bible at home. The references for the Daily Lectionary are from Lutheran Service Book, starting over each year on Ash Wednesday. You can use whichever Bible translation you wish. I recommend the English Standard Version or the New King James Version. Families that follow this daily routine will read through about 1/3 of the Old Testament and almost all of the New Testament every year, and the Book of Psalms will be prayed through at least twice a year. The entire Small Catechism is relearned each year as well. Let us all remain “children and pupils of the catechism.” The resources I am setting before you are not the only possible Lutheran resources that can be used. They are intended to be a useful discipline for keeping our families constant in prayer and firmly rooted in the Scriptures and in the Small Catechism. Putting this discipline into practice as a congregation can only serve to bring us closer together around the truth of God’s Word. As for me and my house, we will begin using these resources today. Shrove Tuesday is the day before Ash Wednesday, the last day of what was once called “Shrovetide,” originally a three-day period before the beginning of Lent. Eventually, the previous Thursday through Saturday was added to make a full week. The word “shrove,” is from the Anglo-Saxon “to write down,” or “prescribe,” as in to prescribe a particular penance after confession. Shrovetide itself is the English equivalent of what became known in the greater part of Southern Europe, and eventually the Americas, as the “Carnival.” Strangely enough, this word, in spite of wild activities to the contrary, is derived from the Latin term for “taking away of the flesh" (carneum levare). The original idea was that during the week immediately before Lent everyone would go to his priest and confess his sins, and the priest would in turn prescribe or “shrive” what he needs to do in the way of penance during the upcoming Lenten season. Most of the time this meant depriving, or “taking away” some pleasure of the flesh. The English custom of eating pancakes on Shrove Tuesday came from the need of using up all eggs and fat or oil, which were originally prohibited in the Christian’s diet during the forty days of Lent. This also partially accounts for the association of eggs with the Resurrection festival at the end of Lent. Although the observance of Shrovetide in England never ran to the wild excesses which often mark this period in southern countries today, still various sports and games were common in almost all parts of the country. In the homes of the rich and powerful it was customary to celebrate the evening of Shrove Tuesday by the performance of plays, or to hold masquerade balls. And we learn from contemporary writers that the day was almost everywhere observed as a holiday, and many kinds of pranks and foolishness were tolerated or winked at in the schools and colleges. Today, Shrove Tuesday has all but disappeared from Christian practice, while at the same time, sad to say, the wild mutation of Carnival has taken hold and indeed run amok. If I might make a small suggestion: The observance of Shrove Tuesday with a pancake supper and an evening devotion (for your convenience a version of the Office of Compline is copied below) would be a small way of paying homage to our Christian forbearers and setting our sights properly on the coming remembrance of the Passion of our Lord. Article XII: Of Repentance (Penance). L: The LORD Almighty grant us a quiet night and a perfect end. L: Be sober, be watchful. Your adversary, the devil, prowls around like a roaring lion, seeking someone to devour. L: But You, O LORD, have mercy upon us. P: Thanks be to God. L: Our help is in the name of the LORD. P: Who made heaven and earth. ALL: I confess to God Almighty, before the whole company of heaven, and to my brethren, that I have sinned exceedingly in thought, word, and deed by my fault, by my own fault, by my own most grievous fault. Therefore I pray God Almighty to have mercy on me, forgive me all my sins, and bring me to everlasting life. L: The almighty and merciful LORD grants to us pardon, absolution, and remission of all our sins. L: Restore us again, O God of our salvation. P: And put away Your indignation toward us. L: Be pleased, O God, to deliver me. P: O LORD, make haste to help me. ALL: Glory be to the Father and to the Son and to the Holy Ghost, as it was in the beginning, is now, and ever shall be, for ever and ever. Amen. P: And hear my prayer. L: Answer me when I call, O God of my righteousness! O sons of men, how long will my honor become a reproach? How long will you love what is worthless and aim at deception? Selah. Many are saying, "Who will show us any good?" For Your name's sake You will lead me and guide me. You have ransomed me, O LORD, God of truth. Who serve by night in the house of the LORD! L: O LORD, You are in the midst of us, and we are called by Your name; leave us not, O LORD, our God. L: For You have redeemed me, O LORD, God of truth. P: I commend my spirit. P: Into Your hands, O LORD, I commend my spirit. L: Keep us, O LORD, as the apple of Your eye. P: Hide us under the shadow of Your wings. ALL: LORD, now let Your servant depart in peace according to Your Word, for my eyes have seen Your salvation, which You have prepared in the presence of all peoples, a light for revelation to the Gentiles and for glory to Your people Israel. ALL: LORD, have mercy upon us. Christ, have mercy upon us. LORD, have mercy upon us. ALL: Our Father Who art in heaven, hallowed be Thy Name. Thy Kingdom come. Thy will be done, on earth as it is in heaven. Give us this day our daily bread, and forgive us our trespasses, as we forgive those who trespass against us. And lead us not into temptation, but deliver us from the Evil One. For Thine is the kingdom and the power and the glory, forever and ever. Amen. P: To keep us without sin. L: Have mercy upon us, O LORD. P: Have mercy upon us. L: O LORD, let Your mercy be upon us. P: As our trust is in You. L: O LORD, hear my prayer. P: And let my cry come to You. L: Visit, we ask You, O LORD, our dwellings, and drive far from them all snares of the enemy; let Your holy angels dwell there to preserve us in peace; and may Your blessing be upon us always; through our Lord Jesus Christ. P: And with your spirit. L: We bless the LORD. L: The almighty and merciful LORD, the Father, the Son(+), and the Holy Ghost, bless and keep us. About Compline . . . The term Compline comes from the Latin "completorium," completion, because this hour marks completion of the day: the end or close of the day. The term was first used in this way around the beginning of the sixth century by St. Benedict in his Rule. However, it is evident from church history that a mid-night hour of prayer existed in the Eastern Church already in the Fourth Century, being used by St. Basil at his retreat in Pontus by A.D. 362, and also in his monastery in Caesarea no later than A.D. 375. The Office of Compline, can be divided into several parts; the introduction, the psalmody, with its usual versicles, the hymn, the lesson, the response, the canticle, the prayer, and the benediction. The current Office has modified the simple Benedictine psalmody by the insertion of a fourth Psalm, and adds the solemn introduction of a benediction with another reading, and the confession and absolution of faults. In addition, the Office of Compline is given a very distinctive character and greater solemnity by the addition of the beautiful response, "In manus tuas, Domine," and the great canticle "Nunc Dimittis." It has always been somewhat of a mystery as to why St. Benedict, who always favored solemnity in this Office, should have omitted these elements, especially the Nunc Dimittus. The Wednesday before the first Sunday in Lent marks the beginning of this season of the Church Year. Lent is the Christian's forty-day journey with the Lord to the cross and tomb, preparing for the joyous celebration of Christ’s Resurrection. The forty days are reminiscent of several biblical events: Moses' stay on Mt. Sinai at the giving of the law, Elijah's fast on his way to the mountain of God, and Jesus' forty-day fast at the beginning of His ministry, among others. The forty days are counted backward from Resurrection Sunday. Since all regular Sunday worship services are an observance of Christ’s resurrection, and thus occasions for reverent joy, the Sundays during this period are not counted in the forty days of more somber remembrance of Christ's Passion. This also explains why this season begins on a Wednesday. In addition, for more than nineteen centuries the Christian believer’s Lenten journey has begun with a reminder of our mortality and a call to repentance through the placing of ashes on one’s head (Genesis 18:27, Job 42:6, Jeremiah 6:26, Matthew 11:21). Ashes are a sign of spiritual cleansing, as in the Rite of the Red Heifer (Numbers 19:17), in which the ashes of the calf, when mixed with water, had the ceremonial effect of purifying the sinner. (Hebrews 9:13). Thus, the first New Testament believers adopted the use of ashes as a symbol of sorrow and repentance over sin. This has been the normal practice of the Christian Church from the First Century onward. It is this ancient practice of placing ashes on the heads of the faithful that gives Ash Wednesday its name. The ashes are a strong reminder of the need for God’s mercy, forgiveness, and the redeeming grace of Christ. Indeed, we remember well the words from the Christian burial service: “. . . earth to earth, ashes to ashes, dust to dust . . . ;” words that will someday be spoken over us all. The imposition of ashes has never been an exclusive practice of the Roman church. It was already being practiced hundreds of years before the church of Rome gained its current prominence. Today it is observed by faithful Believers in many Christian churches throughout the world. Thus, Trinity Orthodox Lutheran Church in Sierra Vista has incorporated the practice of “The Imposition of Ashes” into its observance of Ash Wednesday and the season of Lent. The ashes for this ceremony are taken from the palm branches of the previous year’s Palm Sunday service. These palms are gathered, burned, and then sifted, and placed in a shallow dish for the imposition. After a brief introduction, the minister marks a cross of ashes on each person’s forehead as they stand or kneel at the entrance to the church’s altar area. At 6 AM on Ash Wednesday, during the Noon hour, and again that evening, about fifteen minutes before the Communion Service, people are invited to the Sanctuary for the Imposition of Ashes. This ceremony is intended as a meaningful and useful physical aid in each individual believer’s spiritual preparation for and observance of Ash Wednesday, the season of Lent, Holy Week, and ultimately the celebration of Christ’s Resurrection. If there are any questions about The Imposition of Ashes, please do not hesitate to ask. To God alone be the glory! Amen. Pastor: We gather in the name of Jesus (+), the sinless Son of God. Congregation: Adoration, glory, honor, and praise be to His most holy name, now and forever. C: We ask this through Christ our Lord. (+) Amen. C: To the glory of Jesus Christ, our Savior. of Jesus Christ for your eternal salvation. God’s peace (+) be upon you all. C: God be with you also. Amen. (The people may remain for silent prayer and private mediation. O LORD, mercifully hear my prayer and, having set me free from the bonds of sin, defend me now and always from all evil; through Jesus Christ, Your Son, my Lord, Who lives and reigns with You and Holy Spirit, ever one God, forever and ever. Amen. O God, I believe in You, I hope in You, and I love you only because You have created me, redeemed me, and have sanctified me. Increase my faith, strengthen my hope, and deepen my love, so that giving up myself wholly to Your will, I may serve You faithfully all the rest of my life, and finally be found worthy through Your grace alone to inherit life eternal; through Jesus Christ, my Lord. Amen. O LORD, give me more charity, more self-denial, more likeness to You. Teach me to sacrifice my comfort to others and my desires for the sake of doing good. Make me kindly in thought, gentle in word, and generous in deed. Teach me that it is better to give than to receive, better to forget myself that to put myself first, better to minister than to be ministered unto; unto You, the God of love, be all glory and praise, both now and forever. Amen. Almighty God, the Fountain of Holiness, Who by Your Word and the Spirit guides me in the ways of peace and sanctity, grant unto me so truly to repent of my sins, so carefully to reform my errors, so diligently to watch over all my actions that I may never willingly transgress Your Holy will, but that it may be the work of my life to obey You, the joy of my soul to please You, the satisfaction of all my hopes and attainment of all my desires to be with You in Your kingdom of grace and glory for all eternity; through Jesus Christ, my Lord.Amen. Almighty and everlasting God, Who hates nothing that You have made and forgives the sins of all those who are penitent, create and make in me a new and contrite heart, so that, truly lamenting my sins and acknowledging my lowliness, I may obtain from You, the God of all mercy, perfect and complete remission and forgiveness always; only through Jesus Christ, Your Son, my Lord, Who lives and reigns with You and the Holy Spirit, ever one God, forever and ever. Amen. I can't speak highly enough about President Harrison's words today before a House committee (with several hostile voices on it) regarding the recent HHS Mandate. Below is the best video of the speech I have available at the moment. His entire performance over the course of the meeting was stellar. Thank God for him. It's a good day to be Lutheran, whether WELS or LCMS. Here's the link to Youtube. One of our readers kindly referred us to this stimulating article in the Huffington Post from a few months back. From the article, If pressed about my church's growth strategy, I usually say it is to get smaller and die; to continually decrease the amount of time, resources and energy we spend trying to have the ultimate church experience, and to spend more time actually being faithful. Nowadays, faithfulness —not success— is our only metric. Success is about "doing." Faithfulness is about "being," and it's really hard to measure. All you CGM fanatics out there, don’t even try to build a straw man out of this by suggesting that we’re promoting laziness or lovelessness. On the contrary, we are promoting zeal for the Gospel and tireless love for the neighbor. But this does not mean marketing or targeting or removing “obstacles.” It does not mean vision-casting or leader-building or church-changing. It doesn’t mean finding “new ways” to reach the lost. It means pastors preaching the Gospel just as it has been preached for nearly two millennia, and administering the Sacraments as they have been administered for just as long. It means laity gathering weekly to receive God’s gifts of forgiveness of sins and life in the Divine Service and then scattering into their vocations to lead pious, Christian lives of service to their neighbor. It means trusting the Holy Spirit to do whatever he wants to do through the preached Word, and not trying to change or enhance the results by means of our own machinations and innovations. So, God save us from the successful church. Give us churches who shun sentimentality and pragmatism and aren't afraid to face the inevitable shrinkage which comes as a result of following Jesus. God save us from church leadership strategies. After all, it takes zero faith to follow a strategy, but incredible faith to pursue the kingdom of God and leave the rest in God's hands. If I've learned anything as a pastor, it is this: faithfulness flies in the face of sentimentality and pragmatism, and if you pursue it you have to expect small numbers. You may have seen that there is another Change or Die conference taking place in the Milwaukee area this year. Here is the link. If you have any questions or concerns about this conference, we urge you not to make your comments to us, but rather to make your comments or concerns known directly to the participants in this conference or to your pastor or district supervisor. Dear reader, your first reaction to the above image may be the result of a generational divide in Lutherdom. Some may first notice a Lutheran church promoting itself with the image of a 'Sacred Heart' of Jesus. Others may notice it's merely a figurine caricature. 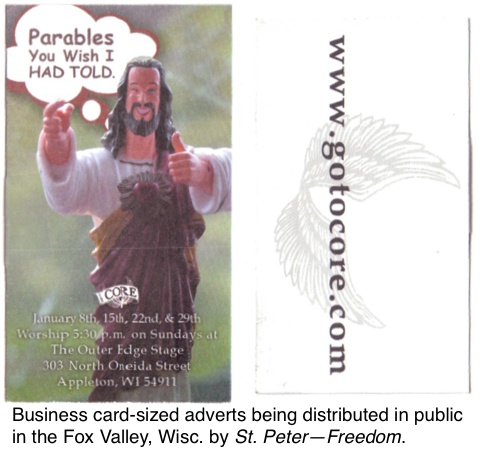 Others still may recognize the image as "Buddy Jesus" most often used as an internet meme to mock Jesus Christ and His Church. The card itself (the obverse and reverse shown above) was conspicuously left in a business waiting area. When I first glanced at it from a distance, I recognized the posture of "Buddy" Jesus and assumed it was an atheist/anti-Christian screed. I picked it up intending only to throw it in the trash — just like I'd have done with Watchtower or LDS tracts —, to protect tender Christians who may be stumbled by whatever text would accompany the current favored meme to ridicule Jesus on the fallen world's internet. The caricature originates in the movie "Dogma" starring George Carlin. Suffice to say, the movie is not an apologetic for sound Christian doctrine. In the movie, a church decides the usual picture of Christ — slain for our sins, dead on the Cross — is too off-putting to get people to come to church. So the priest decides to make up his own Jesus based on what he wants Jesus to be. The script-writers (thinking themselves clever) aren't mocking the Christian Church, but unwittingly, just the Church Growth Movement. The Northern Wisconsin District convenes in June leaving four months for laity (half of the Voters assembling) to contemplate a few questions. Whether Mittelding (aka "Adiaphora") really means 1) purposefully grinding the Lutheran school bus along the guardrail overlooking the rocky precipice while enthusiastically shouting, "As long as we don't actually drive off the cliff, we're just fine! "; or 2) safely keeping the flock on the well-worn path toward the verdant pastures. Similarly, is it scripturally defensible to seek numerical and spiritual growth by fertilizing our doctrine with practices from Zondervan Publishing's Augean stable of heretics like Rick Warren or Craig Groeschel? Despite a half-millennium of sound, encyclopedic Lutheran exposition, who in our Synod teaches that mocking Jesus, "as long as it draws a crowd", is an adiaphoron? I'd like a name.